The study of computing, maths and technology puts you at the cusp of new thinking. These industries are central to the way we work, learn, communicate, socialise and entertain ourselves. Degrees in this area teach you critical skills to develop technology and systems to aid advancements in almost any area you can think of. This includes health, transport, manufacturing, entertainment, mining, artificial intelligence, exploration and beyond. Why study computing, maths and technology at UON? We are No. 1 in NSW for overall quality for Computing and Information Systems. Our graduate employment rate is 86%+ and you will be rewarded with high starting salaries and accelerated career progression. Learn from leading minds like Professor Pablo Moscato who is tackling some of medicines greatest challenges through computer science and applied mathematics. Learn and travel overseas with study abroad programs and international internships. Or join our NUbots robot soccer team and compete against teams all over the world. Prepare to be an innovation leader with tools, training and networks. Start your own company or work for world-leaders like Google, DeepMind or PayPal. Develop unique skills with one-of-a-kind programs like Bachelor of Mathematics which is one of only a few specialised programs in Australia. Video: James is giving kids new skills in computing and technology. We understand that sometimes you don't know exactly which degree you'd like to pursue, particularly with the diverse pathways offered by the study of maths, computing and technology. You may, however, know which field excites you. Use these areas of interest to narrow down your study options based on your interests and career goals. A degree in commerce focuses on the use of maths in the study of money. In this area you will learn to help plan and model populations, interest rates or company growth with a focus on economics. Finance will see your study focus on the stock market, investments and banking. While a study of accounting centres around financial transactions and reporting. Commerce professionals are in demand globally and jobs in this area can be extremely lucrative and rewarding. 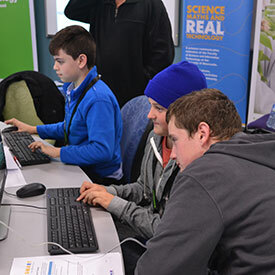 Computer engineering students learn to use digital and computing technologies to solve problems in industrial systems, and in areas such as information processing, data transfer, communications, commerce and travel. Their degree combines creativity with technology, to teach them the skills to develop both hardware and software for electronic and microprocessor-based systems. Unlike computer scientists, computer engineers are less interested in the programming and coding and more on the big picture from design and development to ongoing troubleshooting and maintenance. Computer systems are used for the control and information processing of automated machines. At its core, this area relies on the study of mathematics; computer and software engineering; and coding and programming. Computer Systems and Robotics is at the forefront of innovation and discovery as the world relies more and more on robots and machines to complete basic and complex tasks. Data is increasingly cheap and ubiquitous. We are now digitising analogue content and collecting new types of data from web logs, mobile devices, sensors, instruments, and transactions. We can now also identify patterns and regularities in data of all sorts which has the potential to deepen our understanding of phenomena ranging from physical and biological systems to human social and economic behaviour. A degree in data science focuses on the study of collecting and analysing this data to make changes and advancements in almost any industry. Information systems students learn to design computing solutions for use within business environments. They study how to build systems using web and database technologies within core business areas such as marketing, finance and human resources. Professionals in this area are asked to constantly bridge the gap between business requirements and information technology. Information technology (IT) is all about learning to develop, build and maintain software technology systems to meet the challenges faced by business and society. IT professionals consider solutions integrating multiple products and services to meet business and organisational needs. IT professionals are essentially the project managers and caretakers of technology within an organisation. Mathematics is the science and study of number, quantity, and space, either as abstract concepts as pure mathematics, or applied to other disciplines such as physics and engineering. You will learn how mathematics underpins most technological advances that we rely on every day. Mathematics is essential in a variety of careers or you can specialise as a mathematician or statistician. In a Media production major, you will learn how to create professional media content. This could be in the more conventional media space such as photomedia and traditional media like video, television and radio; or in the virtual space with websites and associated online multimedia. Digital and online media jobs have become more common in recent years as internet and web-based media production work has increased. Software developers focus on analysing a client’s needs. Students in this area learn how to design the best software architecture solutions, coordinate the implementation, integration and testing of software, and provide long-term maintenance. In a software engineering degree, you will study what is behind much of the everyday technology we take for granted - from our iPads, computer software and mobile phones through to digital televisions, computer games and online banking. Dr Aaron Wong discusses his computer science project that allows gamers to use just their thoughts to play Super Mario, hands free. The project could help people with locked-in syndrome, reduce anxiety and have clinical and research applications. SMART is a not-for-profit science communication organisation run through the Faculty of Science. The SMART team perform science shows and workshops for schools and the community. Find out how you can get involved. Each year our NUBots team program soccer playing robots to compete in RoboCup, a global competition aimed at advancing artificial intelligence and robotics. Here's their qualification video for the 2017 RoboCup in Nagoya-shi, Aichi, Japan! 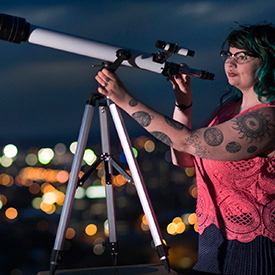 Karlie Noon, a Kamilaroi woman from Tamworth, will be the first Indigenous graduate in New South Wales to obtain a double degree in science and mathematics at UON.